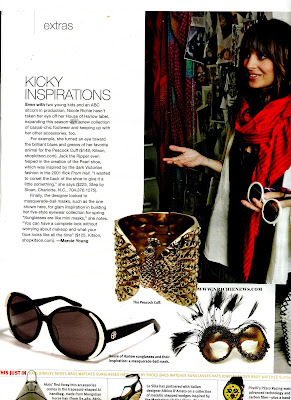 Nicole Richie is featured in Women's Wear Daily. Nicole chats about the inspiration behind her House of Harlow designs. Click on image for higher quality viewing. "Sunglasses are like mini masks." You can definetly create a look around the perfect pair of statement sunglasses. Hi, love the white shades that Nicole helds on her right hand. Do you know their brand by any chance? Thanks alot!